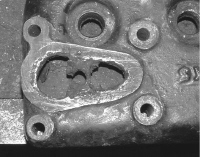 Have you an Austin Seven block or head which, although it is highly treasured by you for some reason, is cracked in the water jacket or the water manifold holding bolts have nowhere to attach to? Well help may be at hand. I have a collection of 1930/40’s car books which deal with the repair and servicing of cars in the days when they were mended rather than the broken bit junked and replaced with a new bit. Within these books are all sorts of repair methods, some well known and others of which need to see the light of day again. Some of you are already thinking that there are plenty of spare engine blocks and heads so why go to all the bother of trying to do a repair. Well the number of spares are limited and every part that is not repaired means the number of spare parts is reduced. If a block or head is beyond redemption then replace it. Sometimes though there are other reasons for doing the repair. In my case the block with my RK saloon was the original block that was in the car when it left the factory. As much of the engine also consists of original parts I was determined to try of keep the block if I could. I used a stitching process to repair a crack. Firstly the crack must not be in any highly stressed area or through into the cylinders, in my case the crack was in the outside of the water jacket and into the side manifold. Although the manifold will apply a certain amount of pressure at this point it is not extreme pressure and the repair will be satisfactory. The block with the crack. A hole drilled at the end of the crack helps prevent the crack from progressing. This first hole will be the start of the stitching repair. The process involves screwing a series of studs along the crack, each successive stud overlaps, and is partially screwed into, the previous stud. This actually makes a surprisingly strong repair and has the advantage that no heat is applied to the component which may be undesirable. If you follow these pictures you will see the process in action. Having drilled the hole, tap a thread in the hole to suit the diameter of rod to be used to make the studs. Any form of thread can be used - even metric! In fact the fine metric threads of about 4 or 5 mm are ideal as would be 0 BA or 2 BA or 4 BA threads. Screw in the threaded rod with stud lock compound on the thread. If you use a tapered tap and make sure that the thread is not fully cut at the bottom of the hole the stud will grip as it is screwed in. The stud is now cut off close to the surface of the work and filed or ground down level with the block. The next hole is drilled along the line of the crack slightly overlapping the previous stud. You can see the amount of overlap of the second hole. This picture shows the completed job with a row of interlocking studs. 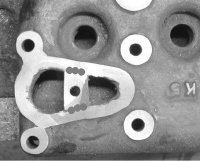 The pattern of studs even go up the step onto the manifold face. Once the studs are flattened down to the surface the block can be given a coat of heat resistant paint and the repair disappears. 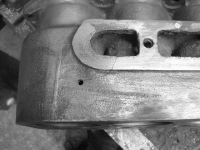 Finally the manifold face should be cleaned up to ensure a flat face to aid jointing. This method of stitching can also be used to great effect to repair the mounting point on top of the head where the top water manifold attaches to the head or indeed the same formation on the side water manifold as shown in the last picture. A broken bar on a head. Without a repair the head would be useless. These bars, cast in the block and head are notorious for cracking and breaking off when the stud or bolt rusts into the casting. To repair this mounting you first need to cut away the old remains making sure that the sides of the cut are undercut. Then a replacement bar is manufactured with shaped ends so that when slipped into place the bar cannot come out in the direction of the bolt. The pictures should make this clearer. Wooden wedge stops the bar from moving sideways and the bolt forces the bar upwards against the tapered seat. 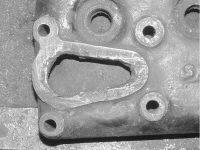 The bar, with a threaded 5/16" BSF hole, is put into place and held from sideways movement by wooded blocks into the manifold opening and held up against the undercut casting by screwing a long bolt into the hole in the bar so that the end of it bears upon the casting below and forces the bar upwards. Take care to only apply enough pressure to keep the bar in place. 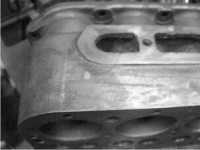 A series of stud stitches, as previously described, are now put down the joins on both sides, the manifold face is cleaned up and the job is done. A solid repair without specialist welding etc. This article, written by Malcolm Watts, originally appeared in CA7C Seven Focus Jan 2004 pp16-20.